It is the start of the 2017/8 season and I thought it would be a nice idea to share with you my experiences in planning and preparing to photography the Flying Scotsman in June 2016. Many mistakes were made - Read on to see how I got on. During the summer of 2016, I was given my first photographic tip-off. 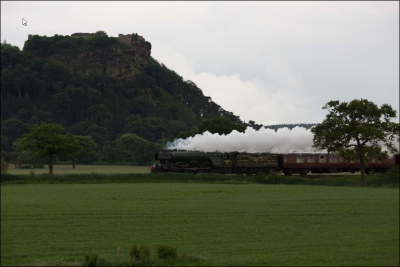 A close source informed me that the Flying Scotsman was travelling through Cheshire on its way to Holyhead via Crewe. The thought of snapping such an iconic steam engine started my photographic juices flowing. I had a couple of days before the event which was in the afternoon so all I had to do was take the day off work, pop down to the railway track and take my shot - or was it? Around this time, I was watching a series of YouTube videos by Landscape Photographer – Thomas Heaton. Tom would think of nothing then journeying off to Cumbria, Wales or Scotland to take breath taking landscape images, however he always plans for them. He knows what image he wants to take and where he is going to take his image before he has even left his home. This process he uses got me thinking. The sudden realisation hit me, I do not know which track this train is going to be on. What time of the day will it be passing through Cheshire? Where will the sun be at that time? Where do I need to be to maximise the available light? Crikey this was a bit more difficult than I thought. I had high expectations of myself show casing a technically correct image of the Flying Scotsman in one of the Clubs future competitions. The more I thought about the photographic issues the more it concerned me that I was running out of time. I needed a cunning plan and for this I needed more information. The modern world provides us with fast cameras, great lenses, superb image quality (for Canon users) and Google! The problem was the Flying Scotsman is so flippin' popular that there is very little widely known information about its movements. This is in the interests of safety in a bid to stop people trespassing on the track as the Locomotive passes by. Armed with an Ordinance Survey map I checked out the train tracks from Crewe to Holyhead. 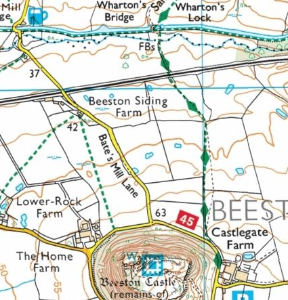 As I recced the area I suddenly noticed the track coming from Crewe to Chester actually passes Beeston Castle. 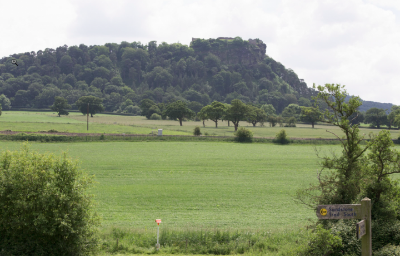 What better landmark could have to represent Cheshire than Beeston Castle in the background. As my excitement grew I had to calm myself down with a hot mug of tea as I pondered time of day and the location of the sun. Where do I take the shot from? What lens do I use? How can I minimise unwanted persons in the shot? What perspective do I want? All good questions in their own right that needed to be answered if I was going to be able to take something reasonable. The other thing about taking this image was composition. How easy is it to compose an image when the subject is travelling at 70-80 mph and unlike car and motorbikes travelling around Oulton Park, in my case I get one chance to get the image right. Having had my drink and allowing the caffeine to take hold working its way through my veins I refocus back on the matter at hand. Right thinking out allowed “If I get onto the canal by the Shady Oak Pub and walk about half a mile towards Beeston and set up, it looks as if there is a shot there. 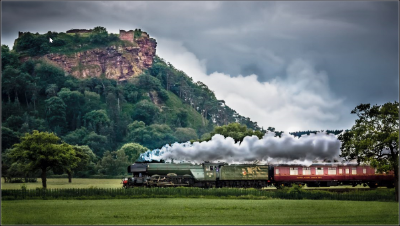 The train will be elevated and Beeston Castle will be the backdrop. The train will be coming from Crewe so would be moving from my left to right, the time would be between 1330 and 1400hrs so the sun or the main focus of daylight would be coming from slightly behind and right of me.” Perfect the plan was starting to hatch out. 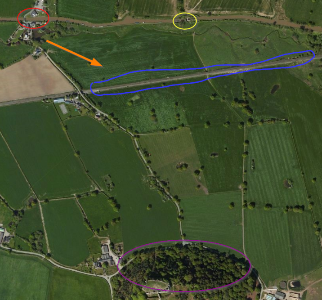 Using Googles mapping tools allowed me to drill down to what I wanted to do. Park the car by the red ring. Walk along the canal to the yellow ring and set my camera up. Take the shot when the train enters the blue ring. Ensure the Castle in the purple ring is in the background. I have just thought – what camera settings do I need? Aperture, shutter speed. There was no use, I had to do a recce. The evening before I packed my bag with a selection of lenses and set off to scout the area. I found an old Canal bridge which lifted me up to similar height to the train lines. This would be perfect. Beeston in the background and potentially some foreground detail as well if I wanted to include it. I took some test shots playing around with different focal lengths and lenses. I finally decided to use my Sigma 70-200mm F2.8 Having completed the recce I felt so much more prepared and ready for the day. Taking half a day off work sounds easy, that is once you have managed to convince your Boss that you really need the time off and it is my big chance to bag a great shot, although I am not talking about my work Boss – I am talking about my wife! Leave authorities issued and permission slips signed and with a fully packed camera bag, over 100Gb of SD card storage (maybe that is being slightly over prepared), I make my way to the Shady Oak Pub at Tiverton and park my car. I had about a 20minute walk to my chosen location. I had left myself with enough time - about 40 minutes or so to set up and wait for the Flying Scotsman – I couldn’t wait! As I trundled along the canal path I wondered to myself how well the image would do in the upcoming season of Club Competitions. I was donning a proud smile, reflecting on all my preparation for this shoot. I was moving up to the big boys – the advanced section. My images would have to be good to bag the points. As I rounded a small bend in the canal my attentions was drawn to three men in a boat – well it wasn’t a real boat, it was a barge but you know what I mean. They were acting strange, they were about 50 - 100 yards away from me and they were standing on the top ridge of the barge which appeared to be moored up. I am an inquisitive person – it comes with the job, I have forgotten about lenses and F stops – I am now firmly focused on the men in front of me standing on-top of their barge. “What on earth are they looking at?” As I muttered to myself the bloody Flying Scotsman shot past me at 100mph. Imagine the scene, imagine what I am feeling – let me try and explain. Have you ever been driving along a motorway listening to the Archers engrossed in the story line when suddenly you miss your turning. Can you remember that gut wrenching, twisted sickly feeling? You think of all sorts of dangerous things you could do, you shout obscenities at yourself - but you resign yourself to the 25 miles and 30-minute detour just to get back to the point you were previously at. Well that’s how I felt. All that work and preparation and either my information was wrong or the train was early, I would never know. I pondered jumping in the canal but as a Negotiator I talked myself out of it. I carried on walking to my set-up point – why I did, I’m not sure but I just felt I wanted to try and complete what I started out to do, even though I had nothing really to photograph. I walked past the three men in a boat and realised they had been waiting for the train, they were all set up with their cameras and had taken images of the Locomotive as it flashed past – bully for them. They had been standing on the ridge of the barge for a better vantage point. I pleasantly smiled as I walked past and made my way to the small bridge. I spent a short time there taking some images of Beeston. Next to the bridge is a Lock, and in the time I was there, the three men had decided to continue their journey and were negotiating the Lock. I engaged in conversation enquiring as to where they got their intelligence from regarding the Scotsman coming past at that time. “The internet!” one of them shouted out proudly. The 'bloody' internet, I couldn’t find anything. Apparently one needs to go pretty deep to find out the information. To places where only the accepted few Train Spotters are allowed to go. It’s the Forums that contain the information I wanted. I politely acknowledge their superior knowledge – overwhelmed with drunken realisation “It’s coming back again to Crewe this evening.” That was great news. I collected my stuff and scurried home trying to work out how I tell my wife I missed the train but the time I had taken off work had not been wasted but I needed to go out again to get the shot. On my return the location, to photograph the Train coming back from Holyhead, I made sure I was at least an hour early. I walked along the Canal to my chosen spot. I noticed other interested parties hanging around bridges and other sections of the canal in wait for the iconic locomotive to make its appearance. The weather and more importantly the light were against me. Despite being in the middle of summer the sky had clouded over and the light was fast disappearing. This was well evidenced by my increasing ISO value as the time got closer the Scotsman’s arrival. I had to resign myself to the fact there was nothing I could do about it. At least the sun, albeit shaded in cloud, was still coming from behind and to my right, which meant my original position and composition should still work despite the train travelling towards me rather than away from me. In hindsight, I think the composition was working better. The Train was due between19.45 – 20.00hrs. One of the other bystanders had a contact at Chester Station who was giving us a running commentary as to the Locomotive’s arrival and departure. As the minutes ticked down I suddenly became quite anxious – this is it, everything was ready, or was it? Yes, I am ready but let me just check again. I had decided to shoot in burst mode to give me the best chance of bagging a great shot. I tried to remain calm whilst watching out for any signs of an appearance with my camera ready, for the train to emerge from a tunnel into my line of view. As it would be travelling quite fast I had to ensure I didn’t outrun my camera’s buffer before the train actually got between me and Beeston Castle. I did have the opportunity to practice on a Virgin Train that I mistakenly thought it was the Scotsman. My last-minute checks were interrupted by the bystander’s mobile phone ringing. This was the call we were waiting for. The Flying Scotsman was on its way. It felt like an age waiting for that old, nostalgic, huge chunk of iron and steel to chug its way into my photographic portfolio. My arms definitely thought it was an age as I was hand holding my Sigma 70-200mm on my Canon EOS 6D. I love this lens but it’s not the lightest. With a couple of deep breaths, the train appeared. Holding as steady as could and daring not to breath I gentle pressed the shutter release. A frantic burst of shots fired off. I momentarily paused allowing the buffer to recover and for the train to make its way into the prime position, my timing had to precise – I fired another burst of shots off and then it was gone. As I checked my images on the back of my camera I was quite happy with the result. Despite some noise from the fading light they seemed to be sharp. I would have to wait to I got home to really inspect the end result. With the wonders of Lightroom I was able to produce an image that made all the frustration, aguish concentration, preparation and gritty excitement all worthwhile. I cannot wait to do it all again. For more information about the Mid-Cheshire Camera Club visit our our website at www.midcheshirecameraclub.org or come along to a meeting on Wednesday evening at 7.45 for 8pm at the Dingle Recreation Centre, Winsford.